It’s grilling season! And guess what? Memorial Day will be here before you know it. Grilling is an all time favorite activity at our house. 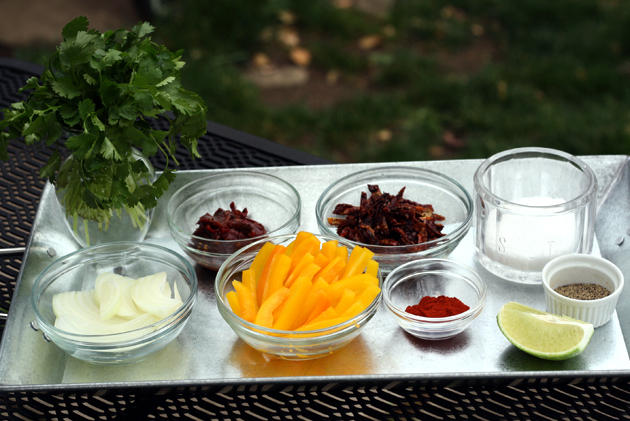 We made these Inside-Out Spicy Pork Fajitas recently and they were so fantastic that we plan to make them again for friends and family this Memorial Day. It’s the perfect way to kickoff summer, don’t you think? This recipe is so festive and easy that I just know it will be one that we will enjoy all summer long. All you’ll need are some pork chops, fresh cilantro, chipotle peppers in Adobo Sauce, sun dried tomatoes, onions, yellow peppers, paprika, fresh lime juice and salt & pepper. First, pound pork chops to tenderize and flatten to wide shape. Place pork in large sealable bags and pour in fresh lime juice, olive oil, cilantro, paprika and s & p. Mix ingredients evenly coating the pork then let marinade for about an hour (the longer the better). Next, place 2-3 pieces each of peppers, onions, sun dried tomatoes and chipotle on the flattened piece of pork then wrap the pork around ingredients securing with a toothpick (be sure toothpick is easy to see to later remove). Place the rolled pork chops on medium heat grill until cooked. Let rest for 5 min then slice into medallions, sprinkle with some leftover chopped cilantro and serve on a flour tortilla. 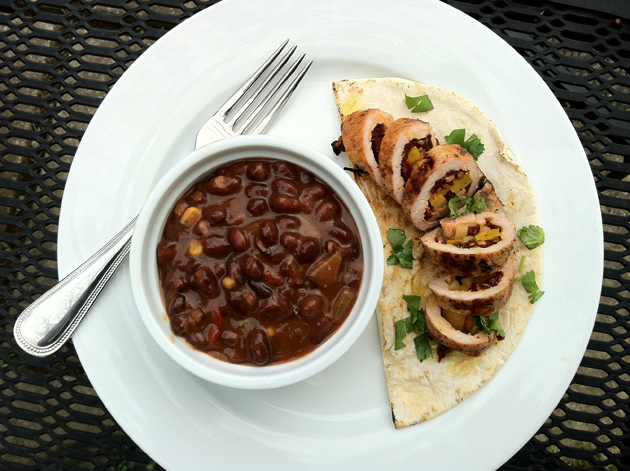 We love to serve our Inside-Out Spicy Pork Fajitas with Bush’s Black Bean Fiesta Grillin’ Beans . The easy heat-n-serve black beans simmered in a chipotle sauce with corn and red peppers make the perfect pairing with the spicy fajitas! It’s a party on your plate as well as in your mouth! “Grillin’ Bold this Memorial Day? Bush’s has the beans for it. 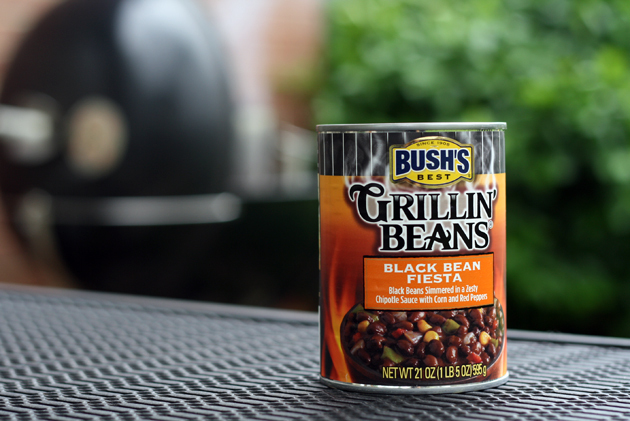 Come join the cookout with Cookin’ Canuck and Hoosier Homemade sponsored by Bush’s Grillin’ Beans.” Stop over to link up your recipe for a chance to win! I’m linking up with these yummy Inside-Out Spicy Pork Fajitas! I can’t wait to see all the deliciousness that you all will come up with! Disclosure: This post was sponsored by Bush’s Beans. However, my opinions, thoughts and photos are 100% my own. Pound pork chops to tenderize and flatten to wide shape. Place pork in large sealable bags and pour in fresh lime juice, olive oil, cilantro, paprika and s+p. Mix ingredients evenly coating the pork then let marinade for about an hour (the longer the better). Slice sun dried tomatoes, onions, yellow pepper and chipotle into thin, evenly sized strips about 1/8″ wide and set aside. 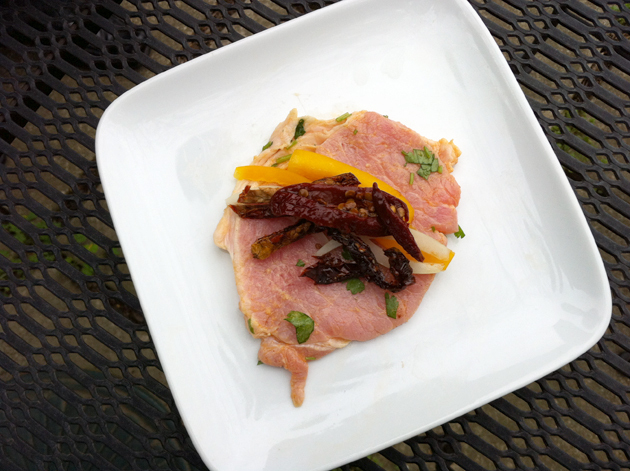 After pork is finished marinading, place 2-3 pieces each of peppers, onions, sun dried tomatoes and chipotle on the flattened piece of pork then wrap the pork around ingredients securing with a toothpick (be sure toothpick is easy to see to later remove). Place on medium heat grill until cooked. Let rest for 5 min then slice into medallions, sprinkle with some leftover chopped cilantro and serve on a flour tortilla. Great recipe for summer! I know Josh will love this one! Whoa! That is so fancy!!! Love it! This is a brilliant idea! BRILLIANT! Looks delicious! If these taste as delicious (and I’m sure they do) as your Chicken Souvlaki Kebobs (which we make quite frequently) then we have just found another grilling favourite. I LOVE this recipe and as always, your photos are mouthwatering! Your fajitas look fab! My husband will loooovee this! 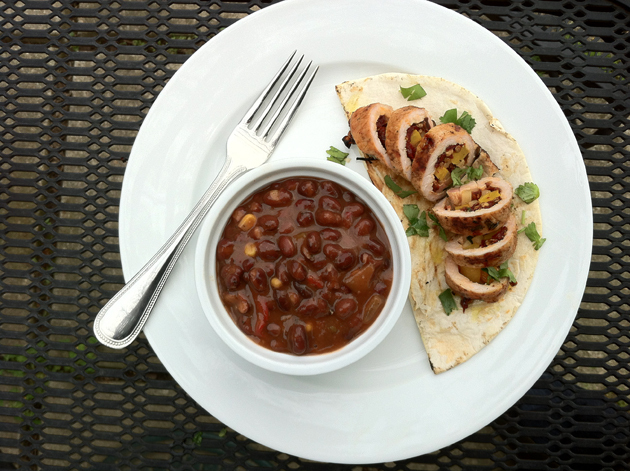 I love the spice and smokiness of the chipotles in this recipe, Wendy! Fajitas are always irresistible to me, so this one is being bookmarked. I’m loving all the flavors in here, especially the chipotle peppers! I will most definitely have to try these soon. Thanks for sharing! YUM! Turn me inside out with joy any ole’ day with a plate of these.